The Lake Forest Park Stewardship Foundation (LFPSF) invites the community to join us for a celebration at 5 Acre Woods (located at 1900 block of 40th Place NE) beginning at 9:00am on Saturday, June 9, 2018. LFPSF will officially present a $100,000 check to the City of Lake Forest Park as part of their community fundraising efforts to purchase the park. A ribbon cutting ceremony will be held with city, county and state legislative representatives in attendance to celebrate this milestone event in the creation of a new park in the largest remaining undeveloped tract of urban forest in Lake Forest Park. The forest was formerly Seattle Public Utility surplus land that was recently sold to the City. Close to 90% of funding for park acquisition has been secured through State funding, King County Conservation Futures grants, a Tulalip Tribe grant and LFPSF fundraising. The City has applied for additional grants to fund park development. 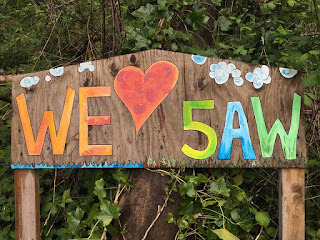 This celebration will highlight the great progress that has been made over the past year in acquiring the land and beginning restoration at the site through a unique collaborative effort between the City and LFPSF. Honey Bear Bakery, a longtime 5 Acre Woods supporter, will provide coffee and pastry treats for the ceremony. Guests are invited to join in a regular monthly restoration work party to remove invasive plants from the site following the celebration at 9:45am. The enthusiastic community response to monthly work parties has resulted in the removal of English ivy vines from hundreds of trees in the park. Temporary work trails have been installed and ivy and invasive plants have been cleared from multiple areas of the park. 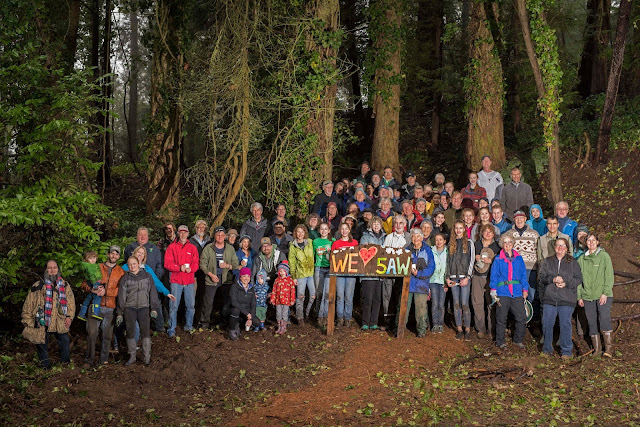 Volunteers ranging from nearby neighbors, school kids, local businesses and even people from surrounding communities, have all joined forces to begin returning the forest to optimal health. After the work party, LFPSF is sponsoring a Hot Dog BBQ at noon to celebrate and acknowledge the contribution of community volunteers to the restoration accomplishments achieved thus far. Over 800 hours of restoration have been logged at 5 Acre Woods since the beginning of the year. Already native plants are beginning to make a comeback after being released from decades of neglect and choking ivy vines. The LFPSF thanks the many donors whose financial contributions assisted the City in funding park acquisition. Bring garden tools, gloves, sunscreen and water bottles to join in the work party. You are welcomed and encouraged to bring a side dish for sharing at the BBQ. Come enjoy a day of celebration, continued restoration and community fellowship at 5 Acre Woods this Saturday. To find out more about this project or donate to the park acquisition, go to the LFPSF website.